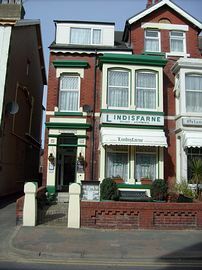 Lindisfarne Holiday Apartments consists of 8 fully self contained apartments available for rent throughout the year. 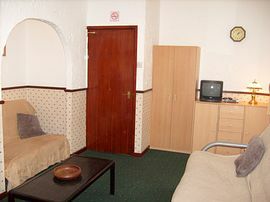 All apartments consist of a seperate bedroom with a double bed and en-suit bathrooom, a kitchen and living area. In apartments for 4 people upwards there are double sofa beds in the living area. 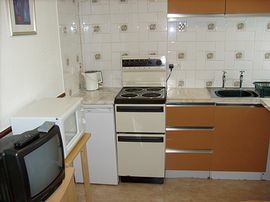 The kitchens are fully equipped with all the essentials ranging from a full sized cooker, microwave, iron and ironing board, TV with Freeview, fridge with freezer compartment, etc. All apartments have an eletric metre that takes £1 coins. 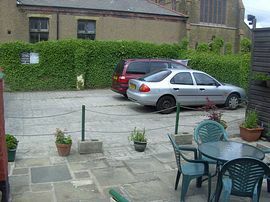 A car parking space is guaranteed per apartment, giving a saving of at least £45 a week. Ideally placed for all that Blackpool has to offer, on the South Shore between Central and South Piers, we are a 10 minute walk from the Pleasure Beach, Sandcastle Water Park and The Tower and a mere 2 minute stroll to the promenade. Blackpool has something to offer everyone, there's plenty of shopping, wax works, Grundy's Art Gallery, theatres, Championship Football, Sea Life, Doctor Who Museum and so on.... You can catch local buses that run frequently, along with the trams on the sea front. Direct links to the M55 and 2 miles from Blackpool Airport. To maintain our high standards we only take families and couples. Take the last exit and follow signs at the roundabout for Yeadon Way. Turn right at second roundabout, then left at next roundabout and left at lights onto Waterloo Road. Turn right at next set of lights onto Lytham Road, then fourth left onto Alexandra Road where you will find us situated just 10 yards on the right hand side. South Shore train station is a 5 minute walk from Waterloo Road. The North train station is a short bus ride away. Alexandra Road tram stop is at the bottom of the street. 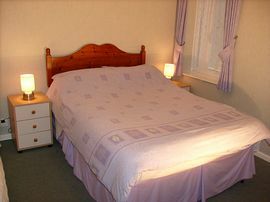 Prices start from £80.00 for 2 people for 2 nights, rising to £305.00 for a week for 6 people. Open all year round with winter lets available.